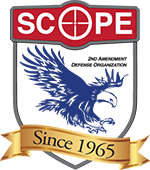 You can join SCOPE online or by US Mail for less than a box of bullets. $25.00 per year helps us fight for NY Gun Owners Second Amendment Rights. To join via US Mail, print out the form applicable and mail with a check or money order.